The art market is worth around USD 45 billion per annum, out of which only ca. USD 3.5 billion represent its online component. In some cases, less than 30% of these ϔigures are eventually cashed in by the artists. 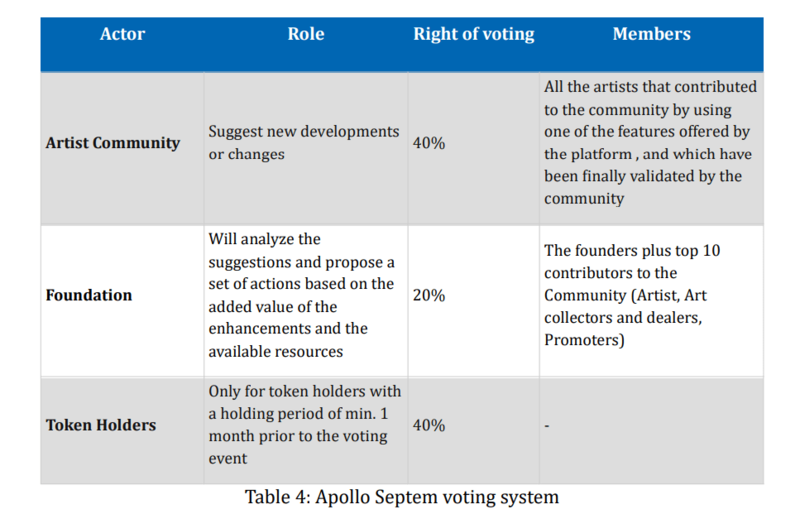 Apollo Septem will bring together artists and art lovers in one single ecosystem that will open new ways towards a democratic and fair artists’ society. Apollo Septem will reshape the art market by directly interfacing the artist and the end customer. It will not be only a traditional online sales platform, but it will instead set the foundation of the artists’ self-governance. The project will leverage on blockchain technology to create a truly secure and transparent environment, shifting away and seeking differentiation from today’s oligopoly. Apollo Septem addresses the main shortcomings of the arts industry by building a new, forward-looking ecosystem for art and artists, using innovative business instruments, online marketing capabilities and cuttingedge technologies. The stated intention is from the very beginning to shift away from the current context and to challenge the use of conventional instruments. The project will design and deliver a brand new ecosystem, where the Art Community will grow and develop in a self-sustainable manner. 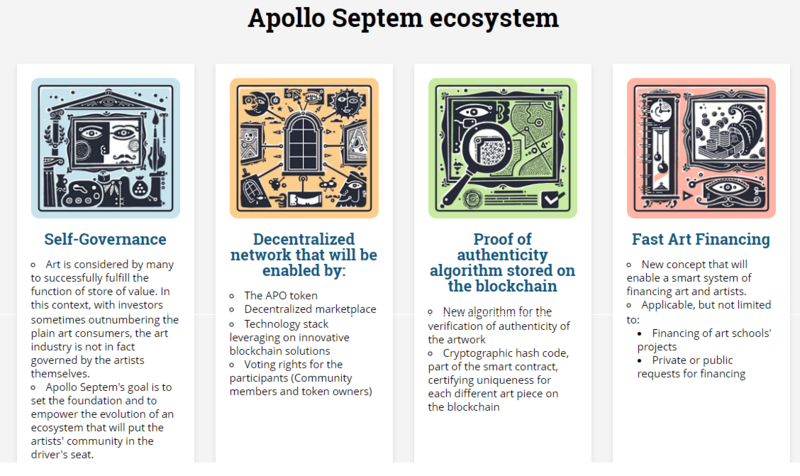 Apollo Septem’s goal is to build a truly decentralized society, governed by democratic values, where all the participants have the right to sustain their beliefs and where everyone feels secure and fairly rewarded. By using a strong technological foundation, the project will regain the freedom of art and artists. The expensiveness and reliability of the art pieces’ authenticity verification. Enable and sustain democracy within the community. Priority when visiting the online galleries. Apollo Septem is not aiming at becoming a commercial enterprise, but at further developing and sustaining a community. For this reason, the general term of “market” has been replaced by the Global Art Community concept. 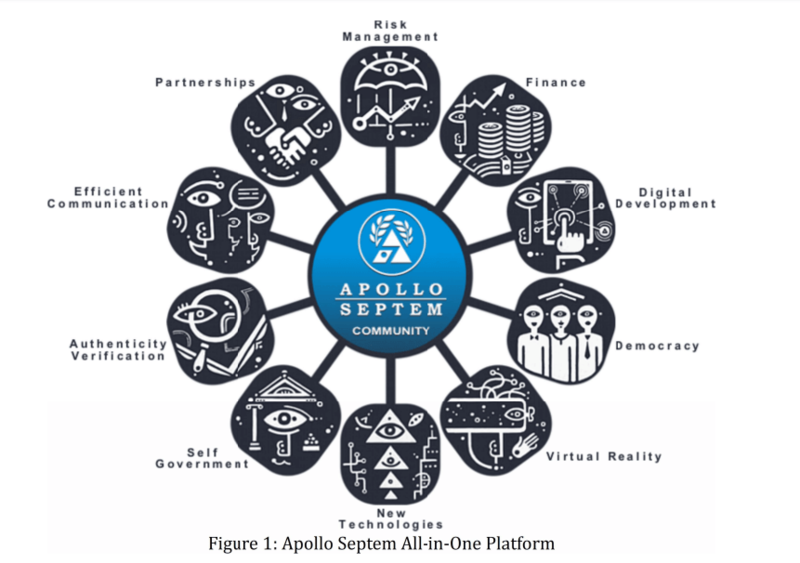 With this approach in mind, Apollo Septem is designing an All-in-One Platform to be the baseline for the entire Community. Online Shop – the community existence and development will be fueled by the APO token that will become the main value transfer method inside the platform, by offering important discounts for its usage. Application phase, consisting of the project proposed for funding, the costs estimation, the delivery plan and the submission for community approval. Validation, based on several factors like artist’s rating, track history and the information provided in the application. Rollout. This assumes the deployment of new ICO-like smart contract. Funds will be collected in a multi-sig address on the blockchain, working as an escrow account. The tokens received by the investors will have ownership rights attached, that can be either monetized on the exchange (early exit option), or held until art work is delivered. In this latter case, the smart contract will work backwards, i.e. the investor’s stake from the ϐinal sales price will be transferred to her/his wallet, while the tokens with ownership rights will be burnt. Virtual Galleries (includes VR) – the content of the modern online galleries will be primarily 2D, as 3D would not the optimal solution for user perception because of most devices’ display limitations. VR will in any case produce a much better user experience. This feature will empower the artist to present and transfer his work to the art collectors in an easy and straightforward way. The numbers of visitors will thus increase significantly, giving the possibility to a high number of art lovers and collectors to admire the exhibited pieces. Further new communities will have the opportunity to explore art. 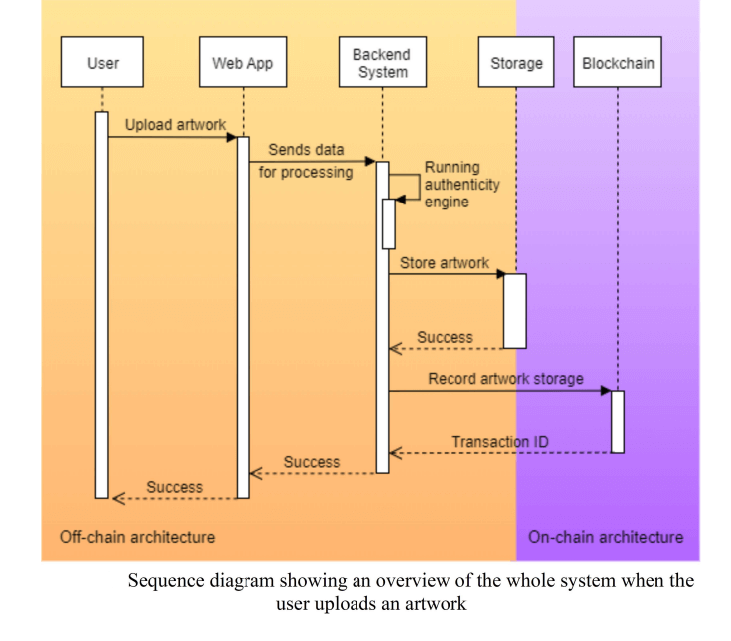 Peer-to-peer Ownership Transfer – lean and transparent transfer of ownership from one individual to another, empowered by the use of blockchain capabilities. Online Shares Offerings – the possibility to split the ownership of an art piece in shares. A buyer of such shares will thus have the possibility to monetize his holdings once the partially-owned art work is sold. Authenticity verification of the art pieces, embedded into the platform. A Certificate of Authenticity will be issued once the art piece is registered on the platform and verified. Distributed Storage System – collaboration with a consolidated storage platform that will offer a low cost and secure solution. Request For Art Work – possibility for the art collectors to organize competitions between artists for pre-ordered masterpieces. Apollo Septem will organize a transparent online event in order to invite the community to apply for a Promoter role. After the initial selection, the promoters can present sustainable strategies and work together with Apollo Septem Foundation to promote the community.